There is a continuing tension in my planner between detailed scheduling (with too much writing and "busyness" on the page) and more broad scheduling (where accidental conflicts sometimes occur). For example, I know on Mondays to do carpool, work for 5 hours, do yoga, and check Edline (a school website) for the kids' homework. But this almost always causes me to double-book something, because even though I KNOW that I have carpool daily and yoga at 8 a.m. on Mondays, when I call the doctor on a Friday to schedule Monday's appointment, I'm not thinking about yoga. That way, when I friend calls to walk this afternoon, I know to cancel yoga, move work up to 8 am, and add in cleaning the house from 3 - 4 pm. I have the information that I need at hand to make the decision. As you can imagine, 6 events in a day really clutters up my calendar. Basically, I cut a memo sheet to a skinny size, hole-punched list and added the routine daily appointments. I placed the routine schedule in the middle of the current month, so that when I need to schedule, both the day's events and repeating entries are right in my sight. 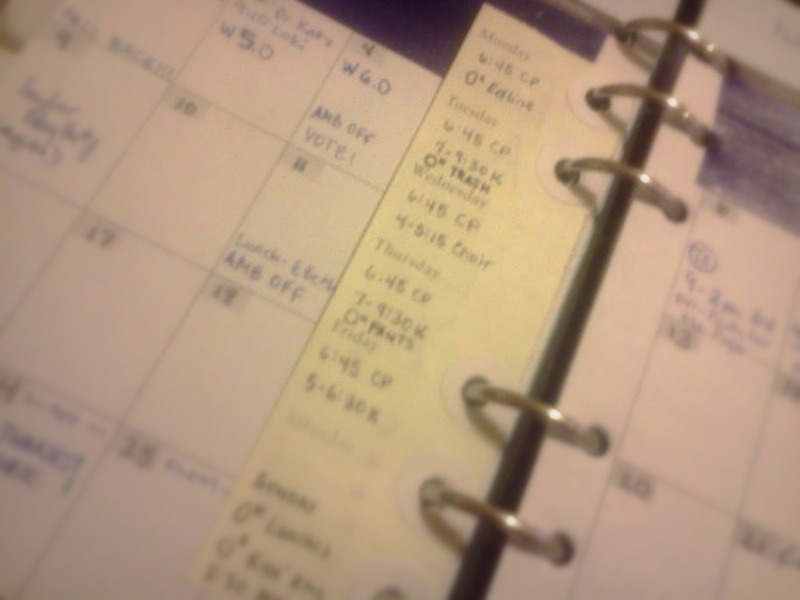 Of course, if a day gets complicated, I make a daily plan with a detailed schedule. Finally, I note deviations from the routine schedule on my monthlies. So when the kids are off for Thanksgiving, I write that there is no school/carpool. 2. Write any deviations from the routine on the monthlies. 3. Check both when you schedule anything. I think it makes sense to have a repeated series of tasks on a separate sheet. I'm changing my weekly cleaning routine system slightly. I got a free printable from Clean Mama and am using that as a tracker week-to-week until the end of the month. Instead of stamping / writing it down onto the daily pages. I've just started yesterday so let's see how it works out.